1. To HDMI, SDI or Analog outputs through compatible hardware from AJA, Blackmagic Design and Bluefish. Click the cog icon next to the External button in the main vMix window and then click Settings. 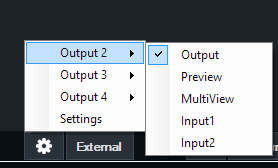 The External Output Settings window will be displayed. For more information on the options available see Settings - External Output. Click the External Button next to the Cog Button to start or stop the output. See the Key and Fill output support section for more information.